Click here for a five-page printable version for free distribution to parents. Copyright © 2000 by Aletha Solter. All rights reserved. No part of this article may be reproduced or transmitted in any form or by any means, electronic or mechanical (including copying to other web sites, and including translations), without written permission from Aletha Solter, with the exception of free distribution of printed copies to parents. Many parents find it hard to understand and accept their children's tears and tantrums, and are confused by contradictory advice they have read. On one hand, much of the advice in parenting books is based on the assumption that crying and temper tantrums are behaviors that should be discouraged. Some people assume that these are indications of a "spoiled" child who is used to getting her own way, while others think of them more as immature behaviors that children must learn to control. It is generally believed that as soon as children are old enough to talk, the job of parents is to help them express their wants and feelings using words rather than tears or outbursts of rage. Even people who recognize crying as a sign of stress and frustration sometimes consider crying to be an unnecessary byproduct of stress. They assume that children will feel better once they stop crying. This belief may lead to efforts to distract children from their crying. On the other hand, there is an increasing tendency to regard crying as a beneficial expression of feelings that has therapeutic value. Many therapists encourage children to cry, especially in situations involving loss. Therapists assume that crying is an important and necessary part of the grieving and recovery process. John Bowlby, the father of attachment theory, pointed out that failure to accept a child's painful emotions can have negative consequences. He claimed that children should be allowed to express their grief openly by crying during situations of separation or loss. He also felt that children should be allowed to express anger at their parents. The result of all this contradictory advice is that parents often wonder what to do when children cry or rage. Should they comfort, ignore, distract, punish, "give in" or listen empathically? In my books, I propose a stress-release theory of crying, and I recommend an accepting and nurturing attitude towards all crying in children from birth on (assuming all immediate needs have been met). Evidence from several different sources indicates that crying is an important and beneficial physiological process that helps people of all ages cope with stress. What does research tell us about crying? Dr. William Frey, a biochemist in Minnesota, has researched the chemical content of human tears. One of the substances found in tears was the stress hormone ACTH. Thus it is possible that shedding tears helps to reduce excessive amounts of ACTH and perhaps other substances that accumulate following a stressful event. Dr. Frey has suggested that the purpose of emotional crying may be to remove waste products from the body, similar to other excretory processes such as urinating, defecating, exhaling, and sweating. Frey's conclusion is that "we may increase our susceptibility to a variety of physical and psychological problems when we suppress our tears." Crying not only removes toxins from the body but also reduces tension. Studies on adults in psychotherapy have found lower blood pressure, pulse rate, and body temperature in patients immediately following therapy sessions during which they cried and raged. Similar changes were not observed in a control group of people who merely exercised for an equivalent period of time. Researchers have looked at the relationship between crying and physical health. Studies have found that healthy people cry more and have a more positive attitude about crying than do people who suffer from ulcers or colitis. Other studies have shown that therapy involving high levels of crying leads to significant psychological improvement. Those patients who did not express their feelings in this manner during therapy tended not to improve, while those patients who did frequently cry in therapy experienced changes for the better. There is typically increased crying and tantrums in children for many weeks following disasters such as a hurricane or a terrorist attack, indicating that the children are attempting to release their terror and other strong emotions. Psychologists have studied crying in children during the highly stressful experience of a long hospitalization. Children who protested openly by crying and screaming at the beginning of their hospital stay showed better adjustment than the ones who were "good" patients right from the start. The latter appeared to be calm and cooperative, but were more likely to show signs of stress later on, such as regression to infantile modes of behavior, eating or sleeping difficulties, and learning disorders. These different areas of research all indicate that crying is a healing mechanism that allows people to cope with stress and trauma. Crying can be considered a natural repair kit with which every child is born. People of all ages cry because they need to, not because they are "spoiled" or immature. Why do children need to cry? 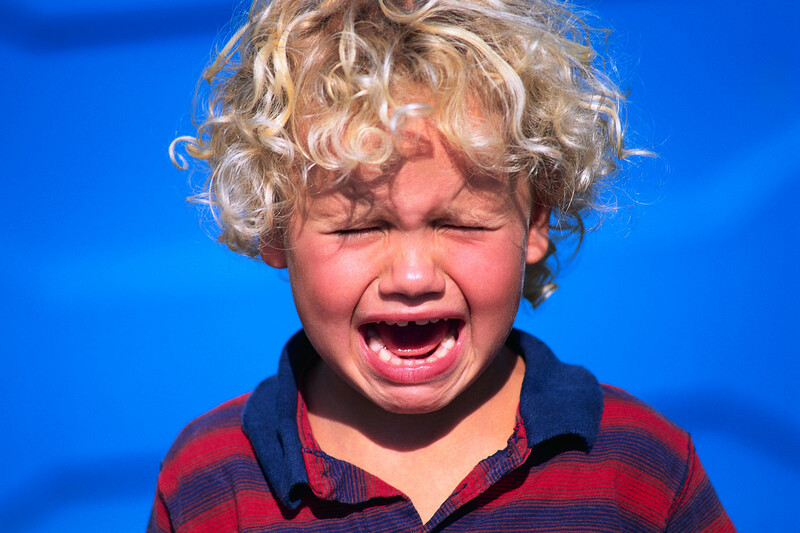 Children cry spontaneously after having experienced any kind of stress or trauma. The more stress there is in a child's life, the greater will be the need to cry. There are many sources of stress in children's lives. Illnesses, injuries, and hospitalization are cause for pain, confusion, and anxiety. Quarreling, separation, or divorce of a child's parents can be confusing and terrifying, as can the presence of a parent's new partner or a stepparent. Children's growing awareness of violence, death, and war can be sources of fear and confusion. Stress can result from a move to a new home, starting a new school, or the birth of a sibling. Added to these major life stresses are all the daily separations, accidents, frustrations, disappointments, and anxieties. In a single morning at nursery school, a child can have a toy grabbed from him by another child, fall from a swing, be served a snack that he dislikes, spill paint on his new shoes, and have to wait for a late parent after all the other children have left. Even happy occasions can be stressful if they are overstimulating. It is not uncommon for young children to burst into tears during their own birthday party, for example. As if this weren't enough stress to worry about, many children also carry the burden of very early experiences of stress or trauma, such as that caused prenatally or during the birth process. Research has shown that babies who had medical complications during birth cry more than those whose births were less traumatic. While much of children's stress is an inevitable part of life, parents can reduce their children's stress level (and therefore the need to cry) by providing a sensitive, accepting, child-friendly environment that recognizes children's needs. Non-authoritarian approaches to discipline are much less stressful for children and also more effective than the use of punishment. Finally, the entire family will benefit when parents look for ways to reduce stress in their own lives. The need to cry gradually builds up until the child feels an urge for release. At that point, almost anything will trigger the tears. Because of this, there are times when the reason for the child's crying is not immediately evident, and the outburst appears to be unjustified by the current situation. For example, a little girl's cookie breaks and she throws herself into a crying fit. Moments like these can be extremely exasperating for parents, but is the child really "spoiled" and "manipulative" as some people would claim? There is another way of looking at the situation. When a child acts in this manner, she may be using the pretext of the broken cookie to release pent-up feelings of grief or anger resulting from an accumulation of stress and anxiety. Children do not cry indefinitely. They stop of their own accord when they are finished. After crying, there is a usually a feeling of relief and wellbeing. The incident that triggered the crying is no longer an issue, and the child usually becomes happy and cooperative. Children do need to learn that loud crying is unacceptable at certain times and places, just as they must learn to use the toilet. However, all children, no matter what age, need at least one adult in their lives who can provide a safe time and place to listen to their emotions of grief or anger. If this kind of acceptance is provided in the home, it will be easier for children to refrain from crying in school or in public situations, and they will save up their crying for their safe home base. Why is it so hard to accept children's tears? It is difficult to allow children the freedom of tears because most of us were stopped from crying when we were young. Our well-meaning, but misinformed, parents may have distracted, scolded, punished, or ignored us when we attempted to heal our childhood hurts by crying. Some of us were stopped kindly: "There, there, don't cry," while others were stopped less kindly: "If you don't stop crying, I'll give you something to cry about!" Many people were praised for not crying. However it may have been communicated, most people received the message that crying was unacceptable. Because of this early conditioning, many adults have learned to suppress their own tears. This makes it hard for them to empathize with a crying child and results in a strong urge to stop the child from crying, just as their parents did with them. In our culture, crying is even less acceptable for boys than for girls. Parents tend to be less tolerant of crying in boys, perhaps because of a fear that their sons will be thought of as weak and unmasculine if they show their emotions. "Big boys don't cry" is a commonly heard expression. The consequence of this is that some men have not shed a tear in years. This suppression of crying in men may be partly responsible for the fact that men are more prone than women to stress-related illnesses and die at an earlier age. It could also help explain why more men than women commit violent acts. When painful emotions are repeatedly repressed, they can become distorted and show up later as violence towards others. Parents naturally want their children to be happy, and feel it is their job to make their children happy, often failing to realize that happiness will return spontaneously after the crying outburst has run its course. Many parents quickly lose confidence and feel they are incompetent when their children cry. It helps to remember that when children cry, the hurt has usually already happened. Crying is not the hurt, but the process of becoming unhurt. A child's tears or tantrums are not an indication of an incompetent parent. On the contrary, crying indicates that the child feels safe enough to bring up painful feelings, and is not afraid of being rejected. How can parents respond helpfully to children's tears and tantrums? First of all, parents can take preventive measures by attempting to reduce frustrations, disappointments, and overstimulation. It is a well-known fact that a tired or hungry child has a lower tolerance level for frustration. Some children are more sensitive than others and are easily upset by overstimulation or changes in routine. A calm and predictable environment with gentle transitions can be reassuring to children who become easily overwhelmed. While it is important to keep stress at a minimum in children's lives, it is just as important to resist the urge to "make things better," if this implies distracting children from their feelings. If a child cries when her favorite toy breaks, it is tempting to say, "Don't cry. We'll buy another one." A more helpful response is to show loving sympathy and reflect her feelings, for example, "You're really sad about that." Although this may temporarily make the crying louder, it will help the child feel understood and will give her the necessary permission to express her feeling of loss. When a child is physically hurt, it is important to acknowledge the pain ("I see that your scraped knee really hurts") rather than deny it or distract the child's attention away from it. Parents can also recognize the emotions such as fear or anger that often accompany an accident: "Was it scary falling off the swing?" Even when the crying or raging seems to be out of proportion to the incident that triggered it, the child benefits when he is allowed to express himself. Perhaps the spilled milk at dinnertime is a pretext for him to release an entire day of accumulated frustrations or disappointments. The most helpful response is simply to allow the crying or tantrum to occur, even though this may require a tremendous amount of patience. If the crying is disruptive, the child can be taken to another room, provided an adult stays with him to offer loving support. No person of any age should be forced to cry alone. It is especially important that children never feel they are being punished for crying. What about children who hit or bite? If the child acts violently towards others while raging, it is important to stop the hurtful behavior. The child can be told that he must not hit another person, but he may hit a pillow. If verbal instructions to stop hitting are not effective, an adult may need to step in and provide gentle restraint, saying, "I need to keep everyone safe. I see you are very angry. I cannot let you hurt anyone, but it's okay to scream and cry." The goal is to stop the violence while encouraging a healing release of emotions. Children who hit or bite are often close to tears but do not feel safe enough to cry. Close and loving holding that interrupts the hurtful behavior can allow the child to begin crying, which is precisely what he needed to do in the first place. A child who has been allowed to cry loudly and freely within the safe boundaries of his parents' arms will then be less prone to violent or destructive behavior. To conclude, tears and tantrums are built-in healing mechanisms that help children overcome the effects of stress and trauma. Acceptance of strong emotions is an essential ingredient in unconditional love and healthy attachment. Children need an environment that permits them to cry without being distracted, ridiculed, or punished. This will allow them to maintain emotional health by regularly freeing themselves from the effects of frustrating, frightening, or confusing experiences. When parents strive to accept and listen to their children's strong emotions, the children will know that they can always come to their parents with their problems, and that they will be loved no matter how sad, frightened, or angry they feel. 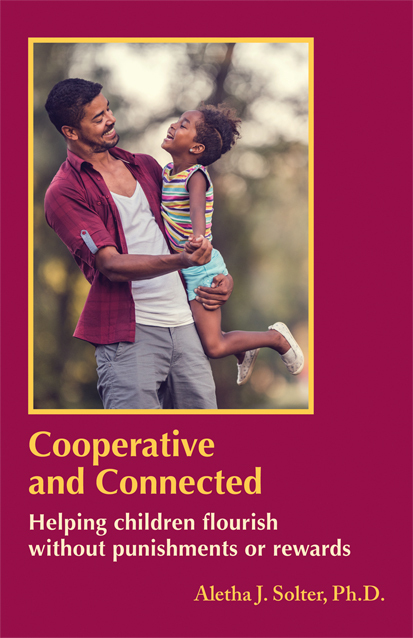 Children brought up with this approach grow up to be cooperative, compassionate, and nonviolent. Furthermore, they have no need to numb themselves with alcohol or drugs. This approach to parenting is therefore an essential factor in reducing the problems of violence and drug abuse in our society. 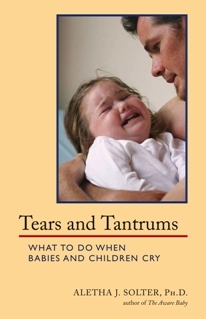 For more information about crying and raging in children, see Aletha Solter's books, Cooperative and Connected and Tears and Tantrums. Interview: How can we respond to babies' emotions? This page was last updated on May 17, 2018. Copyright © 2000 to 2018 by Aletha Solter. All rights reserved. No part of this article may be reproduced or transmitted in any form or by any means, electronic or mechanical (including copying to other web sites, and including translations), without written permission from Aletha Solter. Warning/Disclaimer: The information in this article is not intended to be used as a substitute for medical advice or treatment. When children display emotional, behavioral, or medical problems of any kind, parents are strongly advised to seek competent professional advice and treatment. Some of the suggestions in this article may be inappropriate for children suffering from certain emotional, behavioral, or physical problems. Aletha Solter, The Aware Parenting Institute, and Shining Star Press shall have neither liability nor responsibility to any person or entity with respect to any damage caused, or alleged to be caused, directly or indirectly by the information contained in this article.